The equestrian eventing cross country phase was originally used by the military to prove the courage and stamina of the horse over rough terrain. The military horse that could jump any obstacle in a show jumping arena was fine but really no use to the military if it couldn’t do the same over rough ground during a battle. The cross country endurance test proves the speed, endurance and jumping ability of the true cross-country horse. 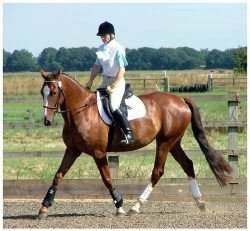 Your event horse should be well trained and in superb physical condition and you, the rider, should be fit to ride and be able to demonstrate your knowledge of pace and how you use your horse across country; without injuring or disabling your mount. Conserving energy on long sections between jumps is just as important as remaining in the saddle over jumps. A fearless mount with superb athletic ability and a fearless rider who, although exhausted, can remain calm and in control; and who can still find the best approach to a really awkward fence; is a rare combination indeed. 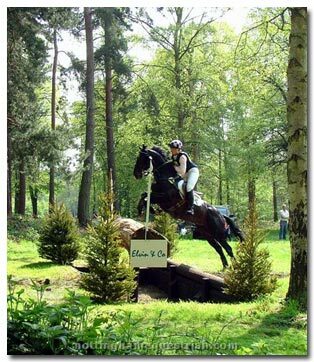 Cross country riding, and indeed eventing in general, is a fun and exciting sport but is not for the faint hearted or the unfit. Both horse and rider should be well acquainted, and the rider must be accustomed to riding for long periods of time before attempting a eventing cross country circuit. For those who are brave enough to try it, and talented enough to master it, cross country riding is an exhilarating and rewarding sport. It will keep bth the rider and horse fit, and improve their work as a team and help them excel in other areas of riding and equestrian sport. Equestrian Cross Country is an endurance test, and is the second phase in the sport of eventing. Each phase should be completed in a set time; with the focus of the entire eventing competition being on the cross-country phase. This warm-up phase is ridden at a steady trot and riders usually give their horses a canter towards the end of the phase; in preparation for the speed required over the steeplechase fences. The A and C roads & tracks phases are very rarely included in modern day equestrian eventing. This phase was designed to test the speed of horse and rider over jumps and requires horses to jump 8 to 12 brush fences, depending on the level of competition. Even though it is usually carried out at a high speed gallop, event riders have to be accurate judges of pace, as horses that finish the steeplechase too quickly will use up the valuable energy needed for the remaining phases. Like the roads & Tracks, the steeplechase phase is very rarely included in modern day equestrian eventing. This is a recovery phase after the exertions of the steeplechase. It is usually carried out at the walk and trot and is followed by a ten minute compulsory halt; during which time a veterinary check ensures that the horse is sound and fit to continue. The event riders saddlery is also checked at this point. This is the most difficult part of the cross country phase; consisting of a course of jumps, usually twice the distance of the steeplechase. It can comprise of 30 to 40 jumping efforts of natural, solid obstacles, such as stone walls, woodpiles, water, ditches, etc. The aim is to jump all the fences within the limits of the time allowed. Penalties are awarded where the time allowed is exceeded. Each obstacle consists of a difficult time-saving route and an easier, longer alternative. Excessive speed is unwise as the horse will run out of steam and have difficulty jumping the more technical fences towards the end of the course. The four phases are quite independent as far as the time-keeping is concerned and loss of time in one phase cannot be compensated for by gain of time in another. Exceeding the time allowed in any of the four phases results in penalties. Penalties are also given for refusals and falls of horse or rider. All penalties are added together and recorded for inclusion in the final classification. The first fall of the horse or the second fall of the rider means elimination.